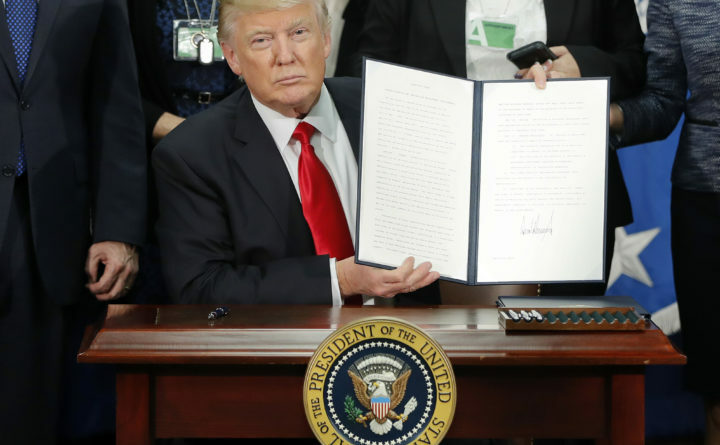 President Donald Trump holds up an executive order for border security and immigration enforcement improvements after signing the order during a visit to the Homeland Security Department headquarters in Washington, on Jan. 25, 2017. A survey conducted by The Associated Press-NORC Center for Public Affairs Research and MTV finds that parents and their kids agree about a lot of things when it comes to politics. Most in both generations disapprove of Trump, and 55 percent say they usually see eye to eye about politics.